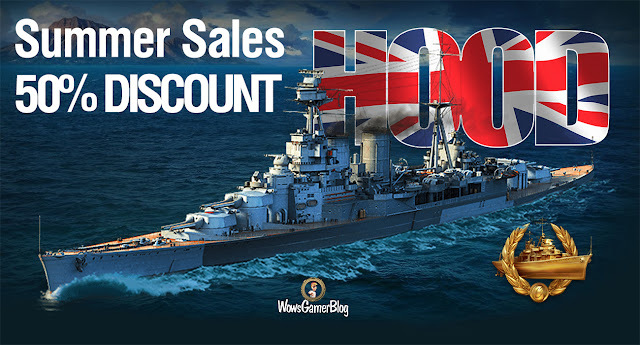 Hood is a British naval legend and the historic rival of the no less famous German battleship Bismarck. In World of Warships, this renowned sea monster comes with a remarkable 67,700 hit points. Hood carries eight 381 mm main guns that make her a good medium range brawler. A speed of 32 knots, great for a battleship, will let you pursue your own tactics by either closing in on or getting away from an enemy ship. With adequate support from teammates, Hood's solid pool of hit points and low citadel will let you push through flanks and curb enemy attacks. An effective rocket-based AA armament that can fire at enemy squadrons at close range. On Hood, this armament is additionally reinforced by the use of the Defensive AA Fire consumable, which significantly boosts the effectiveness and power of the ship's AA defenses. The high top speed of 32 knots will let you close in on an enemy ship or change flank. If you already have this ship in your Port, you will receive 9700 4850 Doubloons as compensation.